*Note: Only one starting quarter can be selected per order. 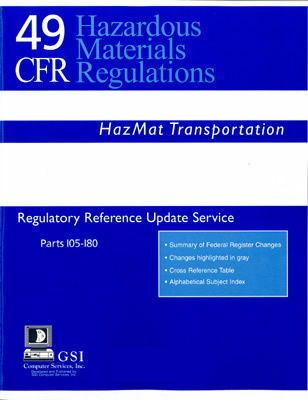 To keep your 49 CFR up to date, you may subscribe to the GSI Regulatory Reference Update Service for 49 CFR directly through GSI Computer Services, Inc. With the annual subscription price of $214.95 (includes shipping and handling) you will not only experience a substantial savings but also direct service. New Editions are released each quarter (4 times per year) which will automatically be sent upon availability.